The 2015 NBA Draft Presented by State Farm is Thursday, August 25 and NBA Digital has been streaming weeklong multi-screen coverage to connected fans eager to stay on top of live and original programming. The NBA.com and NBA Mobile exclusive content delivered to devices includes, breaking news, highlights, expert analysis, behind-the-scenes access, deep dive previews of the best prospects and human interest stories. Turner Sports creates terrific NBA terrific sport technology our readers and followers can learn more about at this link, here. This year’s NBA TV Draft coverage is a balance of professional basketball, sport business, social happenings and NBA Digital tech. Play the NBA’s fantasy game and predict the draft order as a virtual GM with a chance to win a VIP experience to the 2016 NBA Draft. Now that the 2014 season is over and the Golden State Warriors are the new NBA Champions, it is off-season time for owners, general managers, coaches, scouts and trainers to combine their hoops knowledge combined with Moneyball analytics-driven thought processes together with sports tech products, solutions and systems, in order to not make a draftday mistake and miss the next Stephen Curry, LeBron James or Kevin Durant. Get started with the NBA TV Mock Draft 2015 tonight at 9 p.m. featuring a simulated first round as well as an analytical perspective of each proposed selection by Seth Davis, Stu Jackson and David Aldridge, hosted by Vince Cellini. Begin draft day with the 2015 NBA Draft Preview special with host by Matt Winer and top analysts Steve Smith, Davis, Aldridge and Jackson as they discuss the top prospects and topics. Jared Greenberg is headquartered at Barclays Center in Brooklyn offering interviews of draft prospects when they pull up to the venue. Kristen Ledlow is stationed in Minnesota and has insights about the Timberwolves number one draft pick. NBA TV also plans on live coverage from Los Angeles to track what happens with the Lakers number two pick. The 2015 NBA Draft Review airs midnight after the event is over and recaps the draft including news, information and analysis. J.E. Skeets, Tas Melas, Trey Kerby and Leigh Ellis – are part of two draft-themed shows. Watch their draft guide on Thursday, June 25, at 4:30 p.m. followed by stat driven breakdowns of each pick. On Friday, June 26, at 6:30 pm. look for them to analyze impeding free agency. NBA Rooks: Class of 2015 (Tuesday, June 23, at 7:30 p.m.) with an all-access look at some of the draft’s top prospects including Okafor, Towns, Kaminsky, Russell, Emmanuel Mudiay and Kristaps Porzingis. NBA GameTime (Tuesday, June 23 at 9 p.m.), the network’s signature studio show, covering NBA news and highlights, including a preview of the upcoming NBA Draft. Eastern and Western NBA Draft Review (Friday, June 26, at 7 p.m.) with the Eastern Conference review hosted by Cellini, followed by the Western Conference at 8 p.m. hosted by Winer. Smith will provide analysis for both shows. NBA TV to Feature Live & Original Programming including Rookie Draft Desk, NBA TV Draft HQ, NBA Rooks: Class of 2015, NBA TV Mock Draft, NBA Draft Preview, The Starters & More. Fans can visit the NBA Draft hub on NBA.com and NBA Mobile and lock into all the news, features and surprises spanning the fast paced evening. 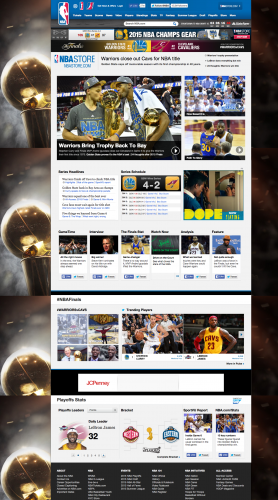 Download and use the NBA Game Time app as an excellent#NBADraft second screen companion. Play the NBA’s fantasy game and predict the draft order as a virtual GM with a chance to win a VIP experience to the 2016 NBA Draft. The draft hub’s social spotlight, content and engagement opportunities for emotional fans are updated in real-time. 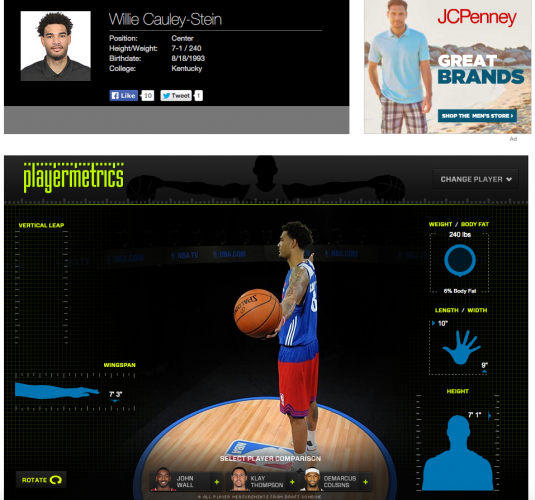 I like NBA Plus player visualization and the Playermetrics 360-degree camera enabling users to review prospects skill sets and use as a player comparison tool. 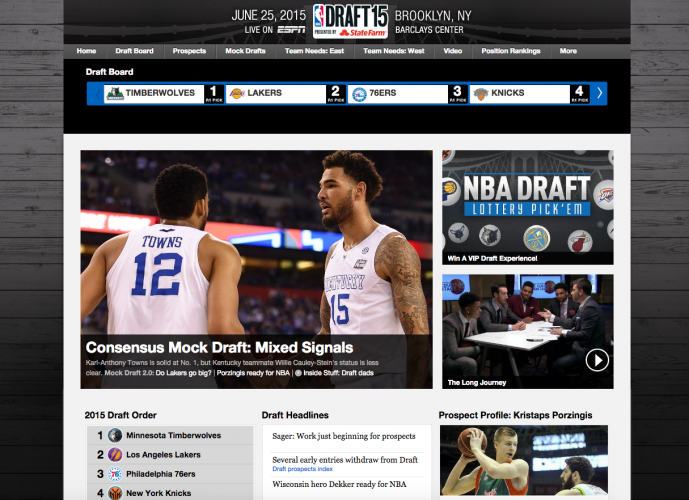 NBA Draft 2015 Digital Content Available On NBA.com, NBA Mobile And Gametime App – SportsTechie blog. The NBA Game Time App Draft Edition, presented by Gatorade delivering the latest news leading up to and throughout the NBA Draft, with video, interviews, analysis, comprehensive alerts and more. All-AXEcess, presented by Axe, a video on-demand franchise on NBA.com, featuring draft prospect interviews conducted by Greenberg as soon as they come off of the Barclays Center stage after being selected. A live video stream from Media Day starting at 12:30 p.m. on Wednesday, June 25, featuring the draft’s top prospects live from their media session in New York the day before the NBA Draft. NBA Draft Lottery Pick ‘Em: Beat the Experts, a new fantasy game where fans compete along with NBA experts Aldridge and Scott Howard-Cooper to predict NBA Draft lottery selections. Participants will serve as a virtual GM to create the ultimate draft card by predicting player selections and matching them with their respective teams for a chance to win a VIP experience to the 2016 NBA Draft. NBA Draft Senti-meter, presented by State Farm, capturing real-time fan sentiment via social media on NBA.com’s draft board. Fans can view the real-time tweets, social trending stats and content driving the social trends with NBA Pulse’s player visualization. Prospect Profiles taking an in-depth look at the top players in the draft with each watching video of themselves as they analyze their own game and traits. Playermetrics 360-Degree Camera, a custom interactive feature allowing fans to use a 360-degree camera to review key information on each prospect such as height, wingspan, reach, and for the first time vertical leap. Fans will also be able to compare those criteria to other recent draft picks. The Playermetrics feature will also be available via NBA Mobile. Social Spotlight continuously keeping fans up to speed on the latest tweets, photos and other social engagement by draftees, teams and the conversations surrounding the NBA Draft. Draft Hub presented by State Farm returning with complete NBA Draft night coverage including news, live pick-by-pick analysis, overviews of all 30 NBA teams and a trade tracker. Draft Tracker providing live pick-by-pick analysis, along with “best available player” tracking throughout the NBA Draft. Where will Emmanuel Mudiay, Justise Winslow and Willie Cauley-Stein be drafted? Is one of the top seven picks the next Michael Jordan or Sam Bowie? Google that kids. Use all the NBA Digital assets to follow critical draft decision making and fan fun. The Atlanta Hawks have the 15th overall pick. Is it time to select a big man or perhaps fill a need over drafting the best player on the draft board? Find out Thursday and 29 other teams do. Our gratitude goes out to Turner Sports for sharing this news with our readers and followers.